My interest is coming much from my background in engineering. I want to find out. My interest for MF is mainly theoretical, I did consider MF from time to time, but I find cost of entry a bit high. Also I'm not negative about MF, but there are some statements which I have issue with. The article that "tho_mas" was commenting on was not really a comparison of DSLR to MF but more of a drill down in the data behind. I don't think it's pro or contra MF. The reason I started this thread I really because there was another thread about the demise of medium format. My take is that MF needs to maintain a critical mass. I guess that just having a bunch of satisfied customers may not be sufficient for that critical mass to be upheld. People using five year old backs don't generate income for Phase and Hasselblad, or do they? Keeping development, manufacture, service and value added resale channels takes a lot money. The other issue on my mind was some communication I had with Stefan Steib (the developer of the Hartblei H-Cam). Stefan feels that MFD industry needs to cooperate to ensure long time survival. Regarding the video..... there are a few interesting points and quite a lot said, but still leaving quite a few questions. He claims that they only used one focusing point because as a manufacturer they were limited buy what components they could find on the market and that all the ones available were for 35mm and that would have meant having all the focus points clusters in the center. completely for the different lens light paths in the body. Even if they focus points were clustered they would still cover a very large area of the screen if a system similar to the d700 or d800 were used. Also Pentax can doe it with the 645D as well as Leica with the s2 and s3. Hasselblad is at it's 5th generation of the camera and they can't do it? ? He claims that only Hasselblad knows the focusing distance and that the others don't use focus distance values and that their corrections just don't work. 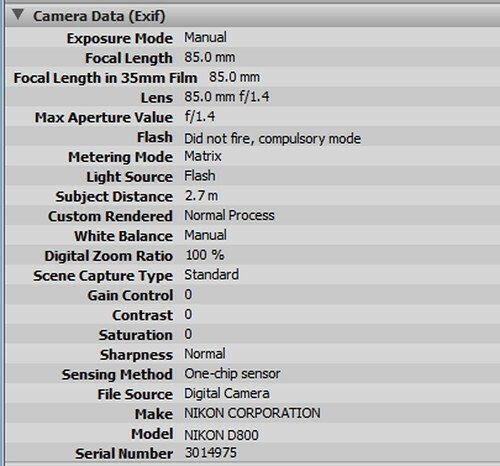 and DXO as well as Adobe use focus distance for corrections as well as zoom focal length. DxO Optics Pro automatically corrects all types of lens distortion by taking into account such signification factors as the focal point and focusing distance. Shooting Iteration: A single “set” of images of the printed calibration chart, shot with the user’s desired camera/lens combination. An iteration (set) of images should have constant camera settings throughout and be of a single camera body and lens model. The lens should be set to a single aperture, focal length, and relative focus distance (focus should remain about the same from shot to shot) for a single iteration. A typical iteration consists of nine images in the set. Different iterations may be shot and profiled for the same camera/lens combination while using a different aperture, focal length, or focus distance for each respective shooting iteration. Also when asked why the Hasselblad Zeiss lenses don't have software correction he answers that they haven't done it yet... well they've had years and years to do it! With Adobe's lens profile creator you can make your own in an hour or so for each lens. Wall street has a term. The people that buy long, sell short hoping for a positive financial reward. Nearly all Artists, photographers especially qualify. Small entrepreneurial companies like Phase/Leaf/Hasselblad/RED also. The upside is they move the ball forward, offer diversity, produce a product not just for maximum corporate bottom line and the throngs of people shopping at Best Buy, but build specialty equipment that is different, for anyone that wants a choice. For people that just want to work differently. Apple, prior to the I-world was the greater fool, Phase/Leaf/Hasselblad fall into this group and thank God, because without them we would all be shooting with whatever plastic cameras large conglomerates offered and all of us would be processing out orange flesh toned jpegs in one software suite. This thread started out as a semi positive and like all of these threads, is pushed by a few people with a negative agenda, with every word twisted to suit a purpose that doesn't do anything for anyone. It's like Sarah Palin invaded a photography forum. Which is a shame because every day, a lot of greater fools pick up every type of camera and shoot something interesting. They don't care what I or anyone use, what is more logical, cheaper, faster or easier. They use what they use because they believe it suits their purpose. Those are the stories worth listening to and it's a shame we don't have more of them. Photographed with RED R1 camera. Broncolor 800 Watt HMI Key light, with Par reflector. Fill 4-4'x8' white foam core with one matthews shiny board on lower portion of stage, out of frame, for fill. Background lights, two Broncolor 575 HMI's with 1/2 spun. All of these cameras are different formats. All of them were purchased and used by me because I liked them. ...They use what they use because they believe it suits their purpose. A breath of fresh air, BC, Thanks! Re: The future of medium format, OK to close the thread?! I agree that we had a great contribution from 'BC' and some great pictures. I think the thread is drying up and what needs to be said has been said. So, if nobody minds, I'll close the thread tomorrow. OK? Refreshing? I find this post is borderline snobbery. the throngs of people shopping at best buy? Fuji makes luxury compacts, leading optical and EVF in the same camera and STILL MAKES FILM CAMERAS. Your beloved and fabulous Contax was made by a conglomerate that also made point an shoots. selection of lenses, accessories and functionality. A Hasselblad camera is not a reward for having achieved a successful career. A Hasselblad camera is the tool with which you build your successful career to begin with. There is never any time like the present to start building for the future. And if you think 35mm is good enough for this stage of your career, then you’d better hope that your clients are also willing to settle for “good enough”. The best clients, however, are almost never willing to settle for “good enough”. And why should they, when there are photographers out there who can provide the best? And providing the best is what Hasselblad and the new H5D are all about. Regarding the disparaging comment of orange skin tones... that is just plain silly and misleading. I see what you mean. On the other hand, BC has a point that small companies do some thinking out of the box and try to make stuff outside the main stream. I would say that many belowed products belong there. The Fuji 68 (a camera I admire), Mamiya RZ67 and also Contax 645 and the Hy6. In the end I ended up with a Pentax 67 and Minolta/Sony stuff. For my part I'm pretty mch interested in both technology, physics and photography. But I see myself as an engineer having photography as his hobby, not an artist. For 95% of clients, 35mm is good enough. Products move on, the 5D3 wouldn't be indistinguishable from the H4D 60 though, but in 4 years time, will it be the same with the 5D4? Bcooter illustrated some fine examples, the last two of which could be shot on today's latest cameras. So the question is, what's good enough? Is there enough business for people to pick up a Hassy and start charging $1000 a day? I don't think there is. That's the problem. The barrier to entry isn't that high, just buy a used H3D. There is just a distinct lack of clients who will pay enough to justify the spend. Nikon were damn smart with that thar D800. Obvious strengths of the Medium format back = High Pixel Count, Depth of field due to the larger format. So make something that targets landscape photographers who don't mind Depth of Field that much and make it have huge pixels with great shadow pull. I think that this thread, unfortunately, has exhausted itself. Any meaningful discussion that people are trying to develop on this forum gets killed by someone who believes that medium format, in order to have a future, has to either turn into 35mm digital or to become an already dead 6x8 film camera system. Heaven forbid anyone should make silly and misleading comments Fred! I see them in my 5D2, 5D3 and 1Dx files. Maybe I should switch to Nikon, or just accept it's a downside to CMOS tech. Has anyone mentioned Hitler yet? MF was great for what it was used to accomplish in the recent past, as I guess it still is today; 35mm /135) was also perfect for its uses and still is, if not even more so with the wonderfully high ISO possibilities it offers. The thousand bucks a day jobs? They certainly did exist, and probably much more so now if only because of the lower value of money; but the thing about MF, then, was that it was a simple tool to operate, required no more investment than the camera and the few focal lengths that you needed, and I got by with three: 50, 80 asnd 150mm. The rest, even the developing tanks were the same because reels were able to accomodate different formats and one enlarger could usually handle from 135 to 6x7 or at least 6x6. It wasn't that big a financial frontier, but now it most certainly is, cash being the single greatest obstacle that I've read here as barrier to MF popularity (as in buying the damned thing). Those already up in the higher planes of the business won't feel any pinch buying; the rest do. Looking at all the shots posted here and in other threads on the topic, on the monitor there isn't much difference. At the end of the day, buy what you want/can afford and what suits your way of shooting. The 'blad 500 Series and all the F, F2, F3 and not F4 Nikons were perfectly good tools for me and none required any greatly different technique, and that was without any idea of tethering yet on the horizon. Now, all people talk about is technique and learning curves: what fun! Seems to me that digital has opened new doors for some and errected impossible barriers for others. So much for it being the great new democracy. Coot produces lovely work and so does Fred; let's not get into dumb slanging matches over bloody camera manufacturers - they ain't worth it - all they want is your money, not your love. This thread reminds me of the question - what's the largest sexual organ? The answer is the brain. So what's the future of MF? That question while valid can also be asked "What's the future of photography". While just about any camera is capable of producing stunning work it's the brain behind the system that tells it where to go. It's the brain behind the final outcome in post. For some the future holds great promise while for others it's nothing but doom and gloom. let's not get into dumb slanging matches over bloody camera manufacturers - they ain't worth it - all they want is your money, not your love. always be someone (a bigger or greater fool) who is willing to pay the higher price. or any sale that is completed by the delivery of a security borrowed by the seller. than the price at which they sold short. Neither of these have anything to do with taking high quality and or artistic images. If anything it may have something to do with art dealers (or maybe equipment dealers). I think if we look at the greater fool theory it really does not hold up at all as far as MFD goes. Hell just look at used prices of current generation MFDB. Phase One IQ140 in exellent condition. Sold for only $ 12,000. Actually I don't think that the small companies are thinking out side the box. Lets look at the cameras you listed. Fuji 68 (I assume you mean the Fuji gx680). Well it's not designed, made or sold by a small company. Fuji is a qiant company. Mamiya RZ comes from what is now a small company in difficulty, but it was designed 30 years or so ago when Mamiya was in full bloom. Just look at the massive quantity of this camera for sale used today. Great camera ... I had several. Contax 645 made and designed by Yashica Kyochera with lenses by Carl Zeiss. Both huge companies. I think it is safe to say that Phase, Leaf and Hasselblad don't really think outside the box. Rather that they are working within the constraints of their roots and the cameras they got started with. and at a fraction of the cost while matching the quality of MF offering 4/5 times the price. They have also come up with all sorts of different camera types with a huge range of choices. Look at all the far from mainstream cameras coming from Fuji, Canon, Sony and Nikon.